If you come here often, you may probably know how much I love testing out new brands, or brands that are new to me, and so I have been very excited to try out the Meder Beauty Science Vita-Long Oil, an essential age-defying longevity oil. This is one of the most high-tech anti-ageing products on the market of which you can use in your own home, and contains 18 active ingredients, ten organic vegetable and seed oils, five potent anti-oxidants and three epigenetic components. We will get to the ingredients later, but right now, that is one powerful complexion cocktail. 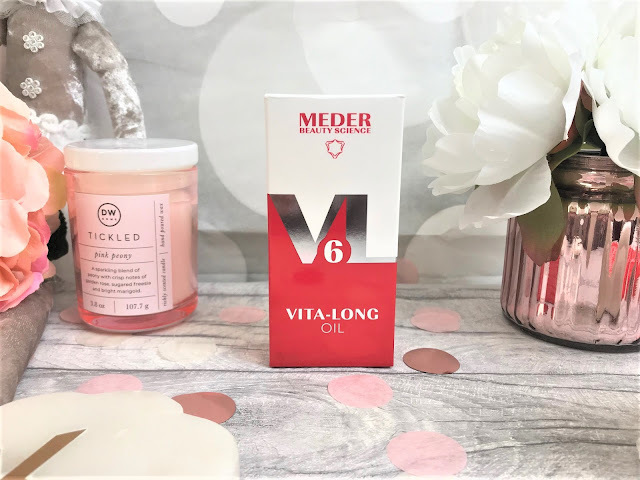 Meder Beauty Science Vita-Long Oil normalises the activity of sebaceous glands, which in turns helps to tighten pores and restore the skin's barrier function, therefore also protecting the skin. Due to the highly concentrated formula, the Vita-Long Oil comes in individual vials, with each vial containing 7ml of product, which gives 14 powerful doses as you only need a small amount per use. Vita-Long Oil is suitable for all ages and all skin types, but if you have dry, thin, ageing skin, then they especially recommend this as part of your daily skincare routine. I personally have very combination skin, I have dry, sensitive cheeks, a very oily chin, nose and forehead, yet they also have some dryness there too and I found no complaint with any reactions or irritability when using the Vita-Long Oil. 10 Vegetable & Seed Oils including Squalene, Macadamia, Meadowfoam, Apricot Kernal, Borago, Sesame, Evening Primrose, Sunflower, Rapeseed and Carrot Seed Oil. These oils restore the skin's liquid complex, replicating the sebum state of a healthy 20-something. Five Potent Antioxidants including Tocopherol, Rosemary Extract, Carrot Extract, Beta-Carotene and Vitamin C.
These antioxidants create a shield against free radicals. Three Epigenetic Components including Coenzyme Q10, GGA and Ephermer. These power players enhance the inflow of oxygen to the cells, increasing cell lifespan by more than 30% and restoring and maintaining the structures of mitochondrial DNA, which is responsible for energy metabolism. It is super easy to include Vita-Long Oil as part of your skincare routine, all you need to do is apply a small amount of the oil to the face, neck and decollete area, massaging lightly until it is fully absorbed into the skin. Each ampule is resealable and lasts for 7-8 days. Meder Beauty recommend using morning and night for at least 7 weeks to achieve a stable, age-defying result. I have been using this for three weeks now, and even in the first week or so, my skin felt so well-nourished and my pores were a lot less noticeable, which is something that normally affects the appearance of my skin. I am 35 years old, but luckily I don't have wrinkles as yet (touch wood! ), and so I cannot comment on the anti-ageing affect of this product, but it is important to use an anti-ageing skincare product no matter what your age so that you don't get wrinkles and fine lines like you most normally would. The Meder Beauty Science Vita-Long Oil can be purchased in a pack of three vials for £69.00 or seven vials for £138.00 and they are well worth the investment. 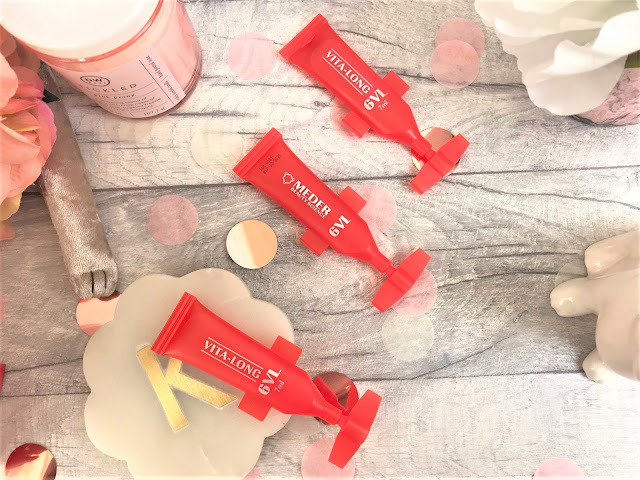 You can find them online at Meder Beauty here.